The Return of Tarzan is a novel written by Edgar Rice Burroughs, the second in his series of books about the title character Tarzan. It was first published in the pulp magazine New Story Magazine.The novel picks up where Tarzan of the Apes left off. The ape man, feeling rootless in the wake of his noble sacrifice of his prospects of wedding Jane Porter, leaves America for Europe to visit his friend Paul d'Arnot. On the ship he becomes embroiled in the affairs of Countess Olga de Coude, her husband, Count Raoul de Coude, and two shady characters attempting to prey on them, Nikolas Rokoff and his henchman Alexis Paulvitch. "Magnifique!" ejaculated the Countess de Coude, beneath her breath. "Eh?" questioned the count, turning toward his young wife. "What is it that is magnificent?" and the count bent his eyes in various directions in quest of the object of her admiration. "Oh, nothing at all, my dear," replied the countess, a slight flush momentarily coloring her already pink cheek. "I was but recalling with admiration those stupendous skyscrapers, as they call them, of New York," and the fair countess settled herself more comfortably in her steamer chair, and resumed the magazine which "nothing at all" had caused her to let fall upon her lap. Her husband again buried himself in his book, but not without a mild wonderment that three days out from New York his countess should suddenly have realized an admiration for the very buildings she had but recently characterized as horrid. Presently the count put down his book. "It is very tiresome, Olga," he said. "I think that I shall hunt up some others who may be equally bored, and see if we cannot find enough for a game of cards." "You are not very gallant, my husband," replied the young woman, smiling, "but as I am equally bored I can forgive you. Go and play at your tiresome old cards, then, if you will." When he had gone she let her eyes wander slyly to the figure of a tall young man stretched lazily in a chair not far distant. "MAGNIFIQUE!" she breathed once more. The Countess Olga de Coude was twenty. Her husband forty. She was a very faithful and loyal wife, but as she had had nothing whatever to do with the selection of a husband, it is not at all unlikely that she was not wildly and passionately in love with the one that fate and her titled Russian father had selected for her. However, simply because she was surprised into a tiny exclamation of approval at sight of a splendid young stranger it must not be inferred therefrom that her thoughts were in any way disloyal to her spouse. She merely admired, as she might have admired a particularly fine specimen of any species. Furthermore, the young man was unquestionably good to look at. As her furtive glance rested upon his profile he rose to leave the deck. The Countess de Coude beckoned to a passing steward. "Who is that gentleman?" she asked. "He is booked, madam, as Monsieur Tarzan, of Africa," replied the steward. "Rather a large estate," thought the girl, but now her interest was still further aroused. As Tarzan walked slowly toward the smoking-room he came unexpectedly upon two men whispering excitedly just without. He would have vouchsafed them not even a passing thought but for the strangely guilty glance that one of them shot in his direction. They reminded Tarzan of melodramatic villains he had seen at the theaters in Paris. Both were very dark, and this, in connection with the shrugs and stealthy glances that accompanied their palpable intriguing, lent still greater force to the similarity. Tarzan entered the smoking-room, and sought a chair a little apart from the others who were there. He felt in no mood for conversation, and as he sipped his absinth he let his mind run rather sorrowfully over the past few weeks of his life. Time and again he had wondered if he had acted wisely in renouncing his birthright to a man to whom he owed nothing. It is true that he liked Clayton, but—ah, but that was not the question. It was not for William Cecil Clayton, Lord Greystoke, that he had denied his birth. It was for the woman whom both he and Clayton had loved, and whom a strange freak of fate had given to Clayton instead of to him. That she loved him made the thing doubly difficult to bear, yet he knew that he could have done nothing less than he did do that night within the little railway station in the far Wisconsin woods. To him her happiness was the first consideration of all, and his brief experience with civilization and civilized men had taught him that without money and position life to most of them was unendurable. 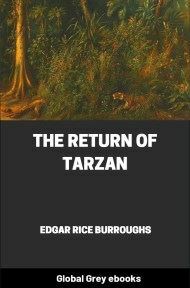 Jane Porter had been born to both, and had Tarzan taken them away from her future husband it would doubtless have plunged her into a life of misery and torture. 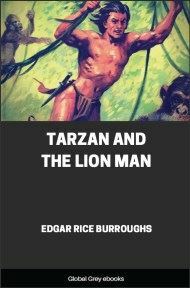 That she would have spurned Clayton once he had been stripped of both his title and his estates never for once occurred to Tarzan, for he credited to others the same honest loyalty that was so inherent a quality in himself. Nor, in this instance, had he erred. Could any one thing have further bound Jane Porter to her promise to Clayton it would have been in the nature of some such misfortune as this overtaking him. 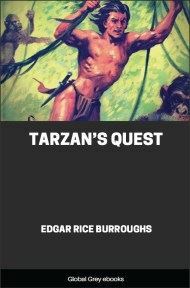 Tarzan's thoughts drifted from the past to the future. He tried to look forward with pleasurable sensations to his return to the jungle of his birth and boyhood; the cruel, fierce jungle in which he had spent twenty of his twenty-two years. But who or what of all the myriad jungle life would there be to welcome his return? Not one. Only Tantor, the elephant, could he call friend. The others would hunt him or flee from him as had been their way in the past. Not even the apes of his own tribe would extend the hand of fellowship to him.